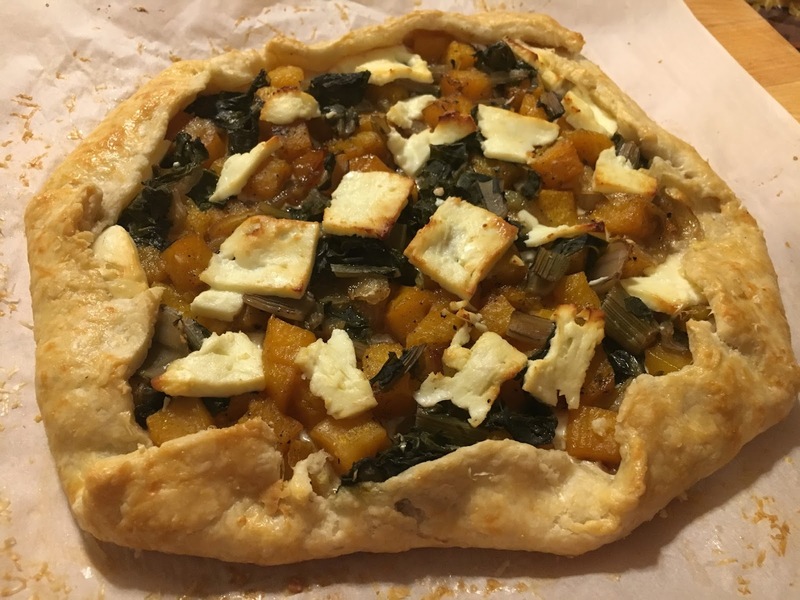 Galette with roasted butternut squash, onions, pickled chard, and feta cheese. While scrolling through my social media feed yesterday, I passed recipe from The Splendid Table for a Butternut Squash Galette and it reminded me of my love for open-faced savory tarts as a quick weeknight meal. 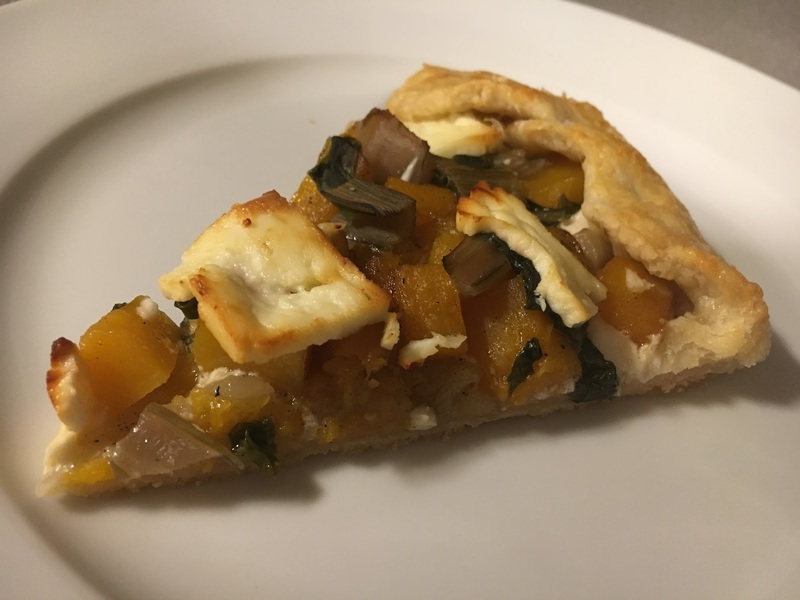 Since I had a piece of butternut sitting in the fridge, I knew exactly what I was going to make for dinner that night. Galettes might sound fancy (it's a French word), but they're really just quick and dirty open-faced pies. If you can make or buy a pie crust, you can churn one out in minutes and it's a delicious satisfying meal. Purchase or make your favorite pie dough recipe for a single-crust pie. Roll or lay-out the dough round on a parchment-lined baking sheet. Spread a very thin layer of mayonnaise, sour cream, thick yogurt, or soft cheese across the dough round, leaving about an inch around the edges uncovered. Add a very thin layer of roasted or sauteed vegetables or bits of meat. Tomatoes can be put on fresh if they're sliced very thinly or diced. Don't put too much or the crust won't be able to hold the weight and keep moisture to a minimum. This is a thin pie, not a pizza. Drop bits of goat cheese, feta cheese, shredded cheese, or even a heavy sprinkle of Parmesan over the top of the filling. Again, this is not a pizza. You're not trying to make a river of melted cheese on top. Less is more. Turn the one-inch of dough around the edges up and over the edges of the filling, crinkling it rustically where it seems to want to. Press down lightly so it stays in place. Brush the edges with an egg wash (an egg beaten with a tablespoon of water) and optionally sprinkle on some grated cheese or salt, pepper, or herbs. Bake in a 375 degree oven until the edges are golden brown and the cheese has melted or softened slightly. Cool slightly and slice into pie-shaped wedges. This is excellent served with a simple green salad. It can also be served at room temperature as an appetizer.